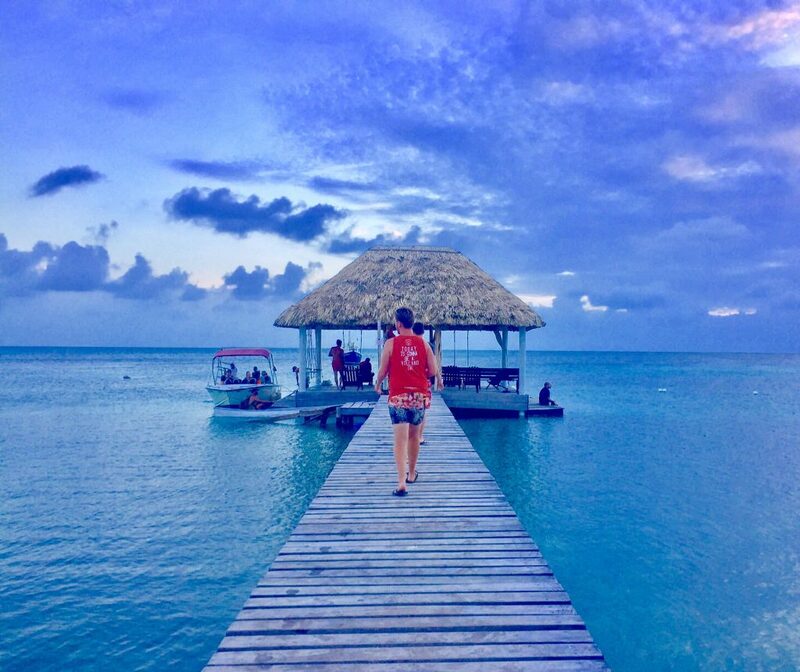 About as near to an island paradise as it’s possible to get on Earth, Caye Caulker is a minute piece of land off the coast of Belize, where the already chilled pace of that Caribbean country is slowed down a notch or two. Divided in two by a narrow channel, this tiny island is easy to explore, whether you’re on foot, on a bike or on a golf cart – cars, wonderfully, are banned. Even on two wheels or two feet, you’re politely asked to go slow; and once you get used to the pace of life here you can’t imagine going any other way! The point of Caye Caulker is not to rush around, or try to see everything in one day, or even to see and be seen. Oh, no, the point is to slow right down and soak life (and the abundant sunshine) in. It’s to feed your soul with the pleasure of doing nothing. Come here for a couple of days and you’ll end up staying a couple of weeks. There are only three streets – Front Street, Middle Street, and Back Street – so little chance of getting too lost! 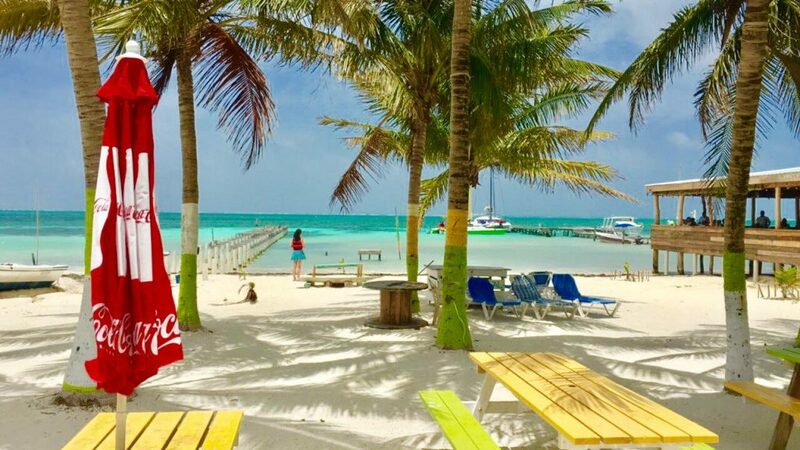 It’s even pretty easy to leave Caye Caulker once you know what you are doing… Prices are relatively low as well, so you won’t need to worry about counting pennies as you extend your stay again and again. As for things to do in Caye Caulker, there’s plenty. Sure, not museums and monuments, but who needs those when the sea is so blue and the sky so clear? 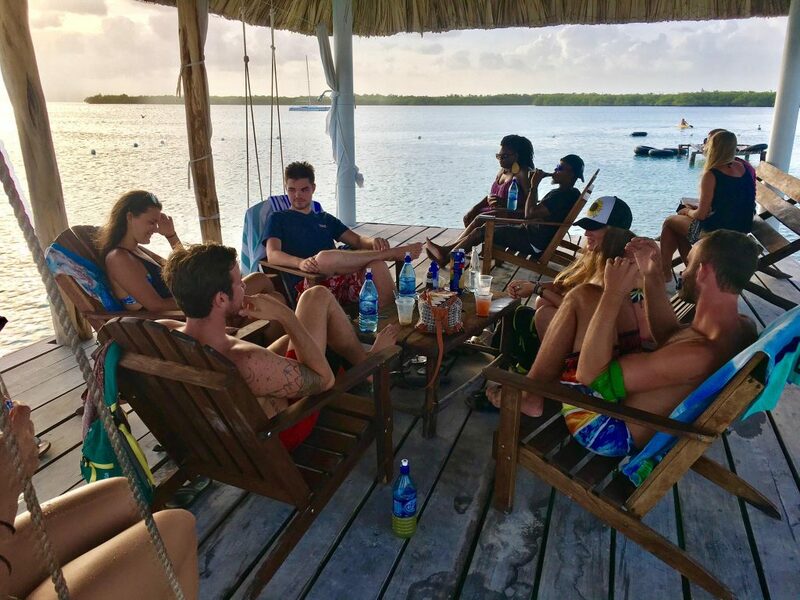 Aim to relax and leisurely fill your days with some of our suggestions for lush things to do in Caye Caulker. Let’s start with the obvious one, because that’s what you’re here for and it’s what you’ll see everyone else doing. The Split is possibly the most popular hangout for visitors and locals alike. It’s the channel of water separating the two halves of the island (inhabited and uninhabited). You’ll find a dock to sunbathe on; bars to drink in and you can hire kayaks and paddle boards if you just have to have a little activity in your day! Otherwise, you can simply float about in the sea watching the goings-on. You might think you’ll only spend the morning here before exploring further; that will suddenly become the whole day, trust us! 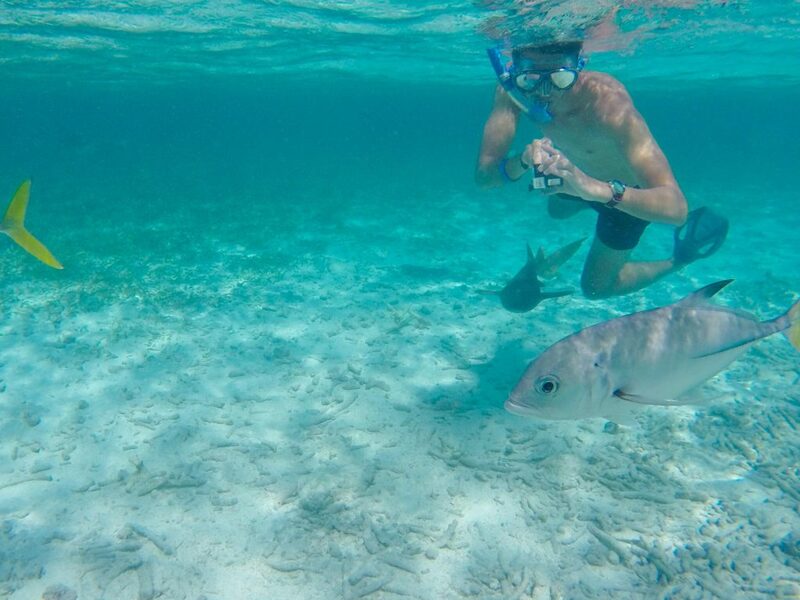 Almost nothing can match the experience of swimming with animals – it’s an exhilarating feeling and you feel incredibly privileged to be permitted into the creatures’ world, even just for moments. 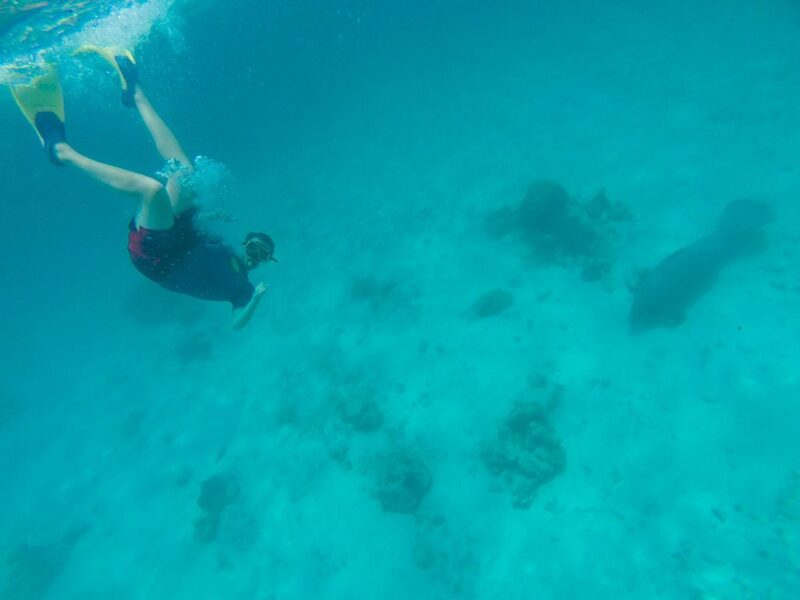 Snorkelling with manatees at Caye Caulker is no exception to this. There are tons of companies offering the chance to do this, so you won’t be short of opportunities. Make sure you ask about the steps they take to conserve marine life so you feel confident you’re doing this in the most sustainable way. Manatees are incredibly docile and cute, and swimming with them is a very relaxed experience (you wouldn’t expect anything else from Caye Caulker!). You can float around and watch them do their thing, which is also floating around. 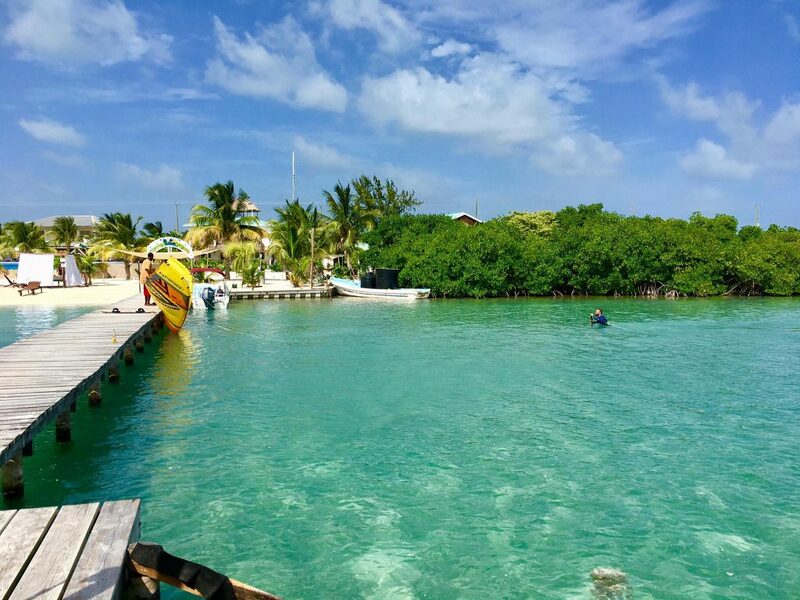 If you’re into diving – or always intended to try it out – then scuba diving is one of the best things to do in Caye Caulker. 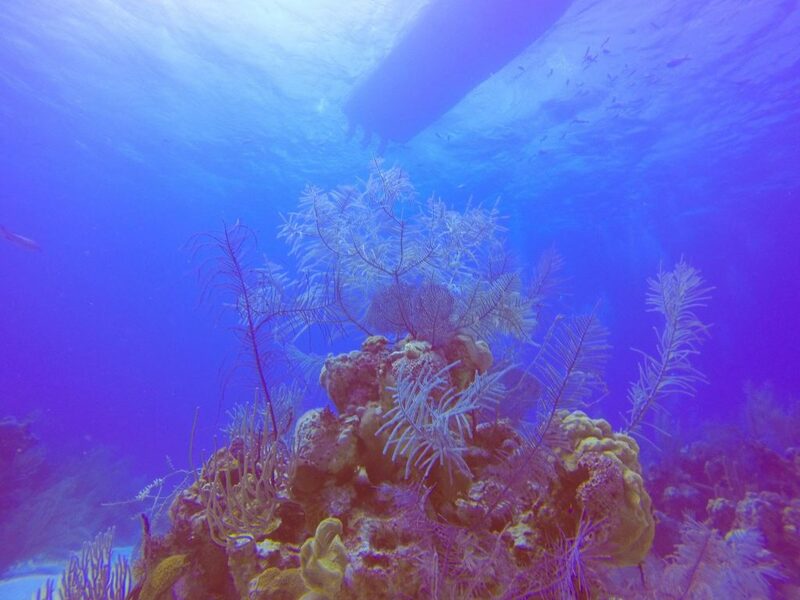 The underwater world surrounding the island is a diver’s paradise, with the Blue Hole natural monument being one of the highlights. This 1000 foot by 400 foot hole (yup, those dimensions are correct – it’s huge!) is among the world’s most popular dive sites. It requires caution, of course, and a great dive master, but it’s well worth it. You’ll wonder at the vast space surrounding you and the stalagmites and stalactites adorning the walls. This is an astounding dive and one you’ll still be talking about years later. Perhaps you’re a less experienced diver, or you prefer to float along a reef rather than descend into a hole (either one is fine). If this is the case then we’d recommend doing some diving at the world-famous Turneffe Reef. The clarity of the water is unbelievable, resulting in some of the best visibility of any diving you’ve done. 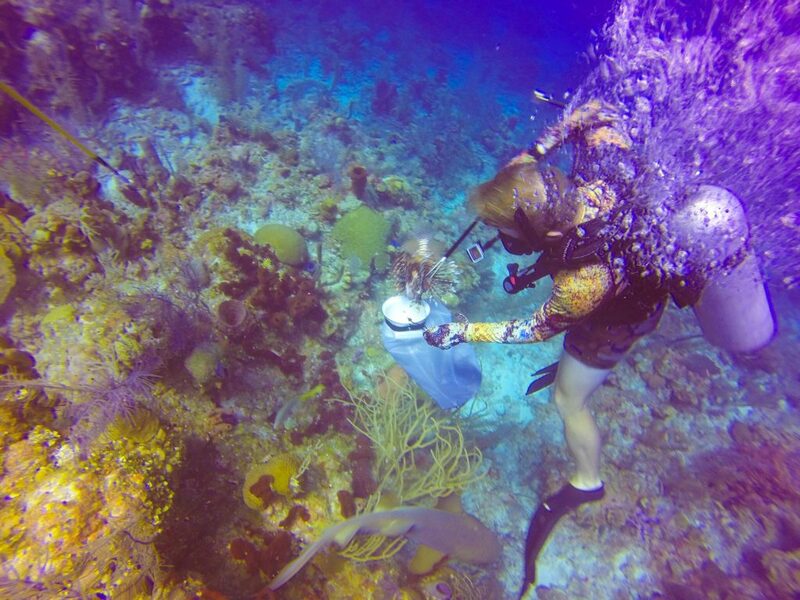 You’ll explore canyons; see a huge range of wildlife and some beautiful coral. 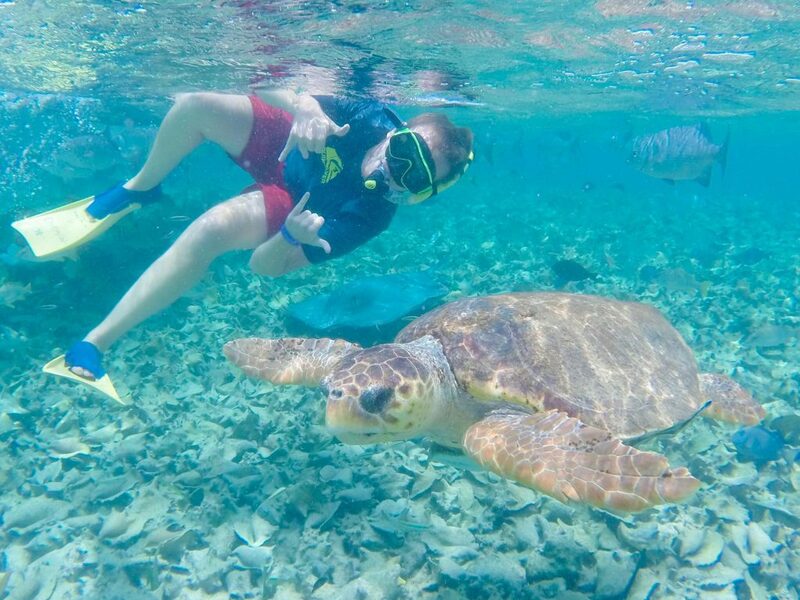 Turtles, sharks, eels, colourful fish and rays can all be found living their best life at Turneffe Reef – hopefully, you can join them. Sure, scuba diving is amazing and all that, but it’s pretty exhausting. 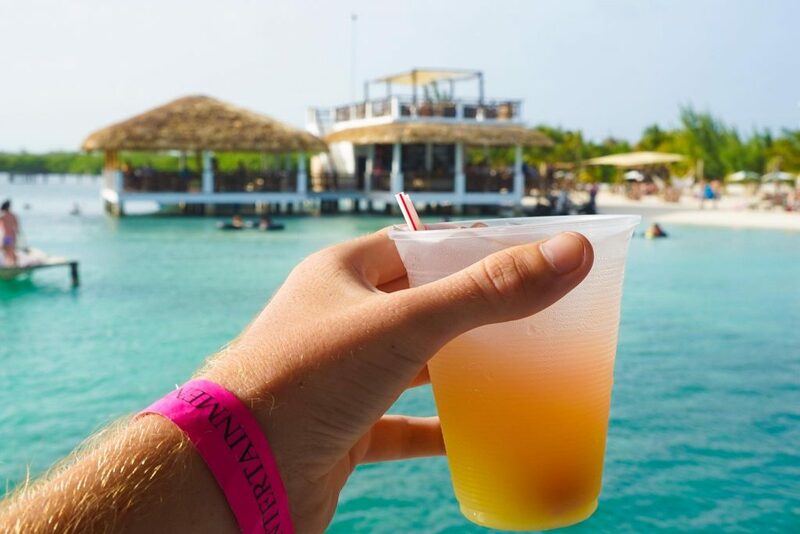 After all of that activity, you’ve definitely earned your right to a delicious rum cocktail at the Split or nearby Sea breeze dock. From here you can watch the sun go down over the water, often putting on a spectacular display. There’s no pressure to have a rum cocktail of course – any spirit will do, or a beer if you’d rather. Try to aim for the happy hour to maximize your cash! A bit of an island tradition, after a long, hard, day of … well, anything really, is the Happy Hour, good vibes, music, and conversation at the Lazy Lizard. Everyone just somehow migrates here, located adjacent to the Spit for delicious mojitos, fun games and to meet new people. You’re sure to spot at least a few people you know, and with the right attitude – meet many new friends to explore the island with. With beach chairs, a long wharf, sublime water, and hammocks there is something here for everyone – and it’s the kind of place you head to in the afternoon and stay well into the evening. Prices are reasonable – and if you time your visit, there is normally daily Happy Hour until 5. The food is excellent, the staff hilarious, the atmosphere one of a king. Boat runs start at 11 a.m. and then every half hour. 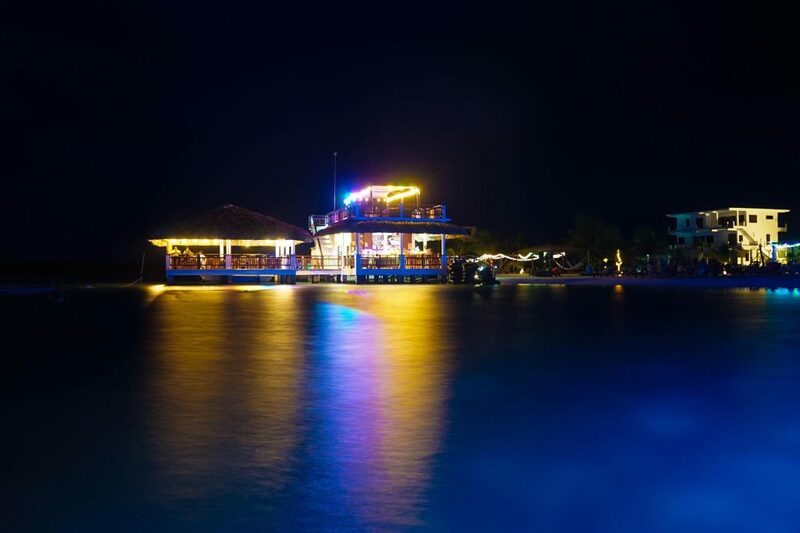 There’s definitely a true laid back Caribbean atmosphere in Caye Caulker and nowhere is that more apparent than in the chilled nightlife. Don’t expect hard-core techno dancing all night (go to Berlin for that, guys!) 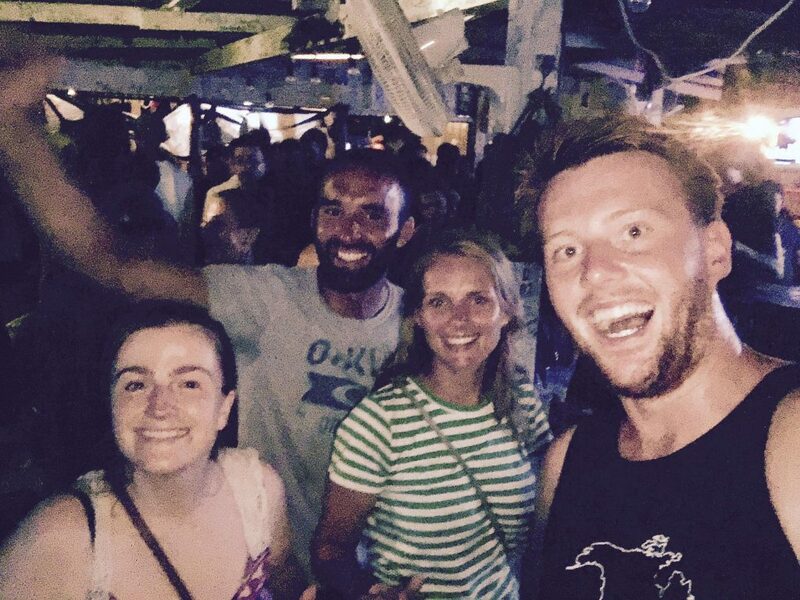 but do expect to accidentally stay up until sunrise shooting the breeze with the locals and dancing to reggae. There are plenty of seaside bars where you can grab a piña colada or an ice bucket full of beers and just kick back. Here, the evenings melt into nights and you’ll end up with tons of new friends and a plan for the next night in the bar next door. 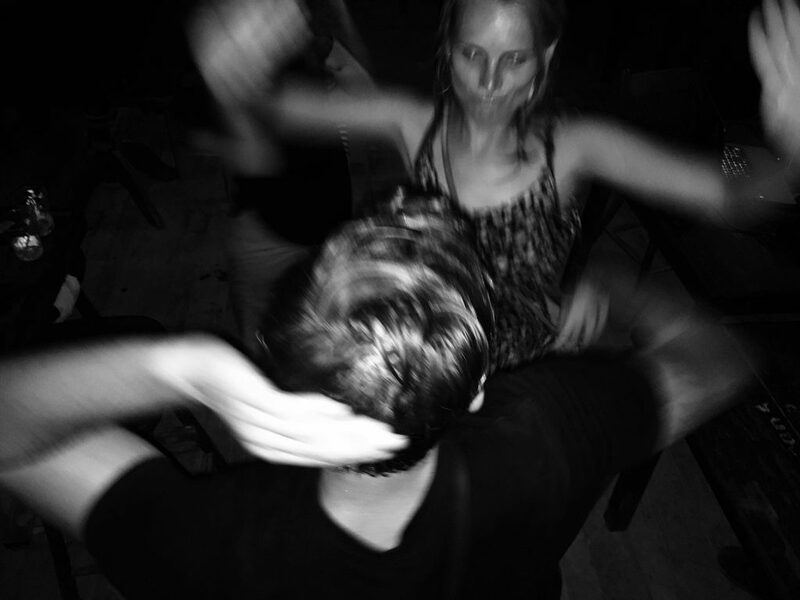 The dancing, as you can imagine, is relaxed and carefree, just as it should be! The northern half of the island is pretty much uninhabited, home only to diverse wildlife (and the occasional exclusive resort). Here you will find acres of nature reserve which you can explore to uncover the untouched tropical jungle. There is a range of hiking trails and tours if you want to learn more – or you can kayak over. You’ll see mangrove forests, a huge array of birds and even crocodiles! There’s some important conservation work going on to protect the ecosystem. In today’s increasingly overdeveloped world, that’s something pretty special to see. Even if you’re here to relax, this is one of the best things to do in Caye Caulker (the rum cocktails will still be there for you!). 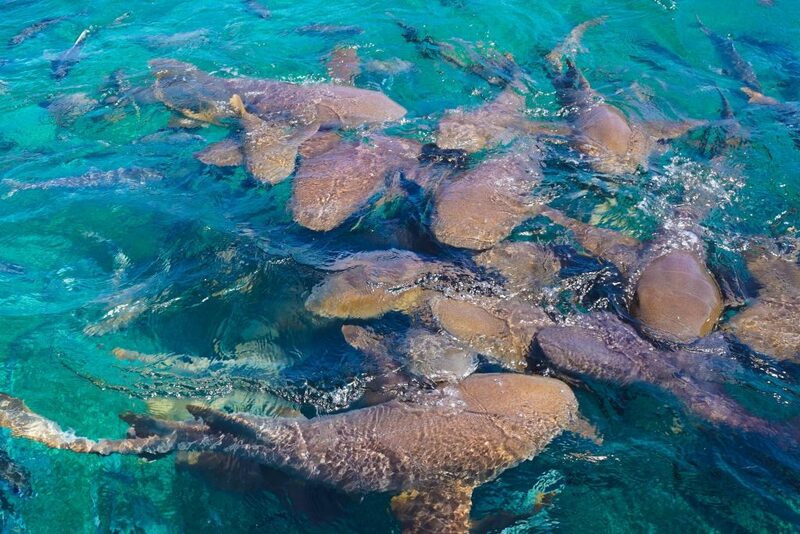 If you get extra lucky, you might spot a manatee – or a turtle, but there really is nothing else like Shark Alley. 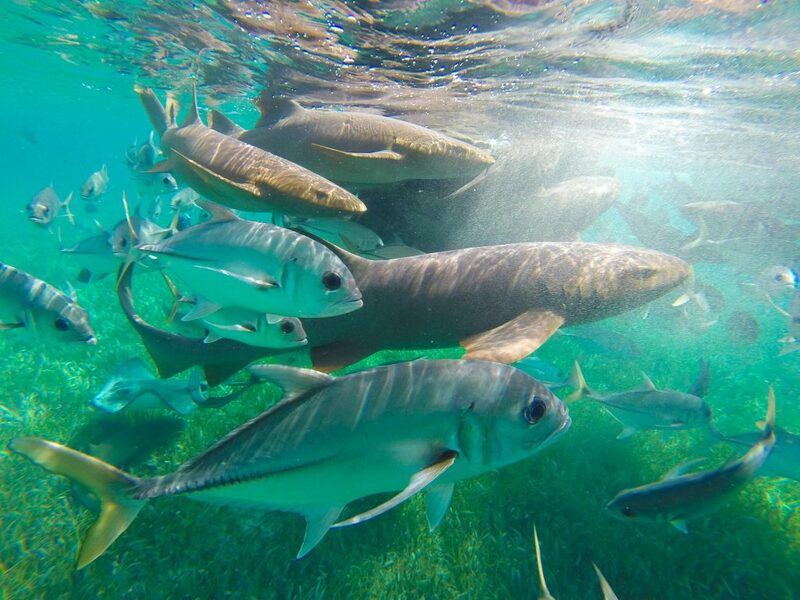 Hundreds of friendly sharks to feed, and stingrays, they all feel so weird – and just want to be your mate! Don’t get afraid…Jump in! We can’t pretend that this is the healthiest local food you’ve ever tried, but on the plus side it’s cheap and delicious! This Belizean dish is basically a full English breakfast wrapped up in deep fried dough – yup, that’s beans, egg and cheese fried in dough. Your arteries won’t thank you for it, but your taste buds will. If you’d rather something a little more sophisticated then Caye Caulker is also famous for its seafood, with July marking Lobsterfest. That’s right, a whole festival just for lobster. It’s certainly nothing you’ve ever been to before, so if you’re a fan of crustaceans this is a good time to come. Even if you’re not there in July, there are numerous street stalls selling grilled seafood – amazing! We’ve spoken about the amazing things you can do in the water but if you’re not a keen swimmer then fear not, there’s plenty you can do on the water as well. Avoiding the water isn’t really an option on such a tiny island! Hop on a boat and go skimming across the turquoise waves, peering into the water below for sightings of rays and fish. Kayaking is also a fun way to see more of the island – as well as being relatively cheap and incredibly peaceful. As we mentioned before, this is a really fun way to see the northern part of the island as well. I know what we’ve been describing isn’t exactly a stressful experience, but if you do need to escape the hustle and bustle of life on a tiny car-less island (joke) then why not make a trip to the local spa one of the things you do in Caye Caulker? They’re actually surprisingly good places to visit, not only for the excellent treatments. The massages are relaxation taken to an art form and the local staff are friendly and welcoming. You might also end up with some tips on what to do around the island if you get chatting to people! 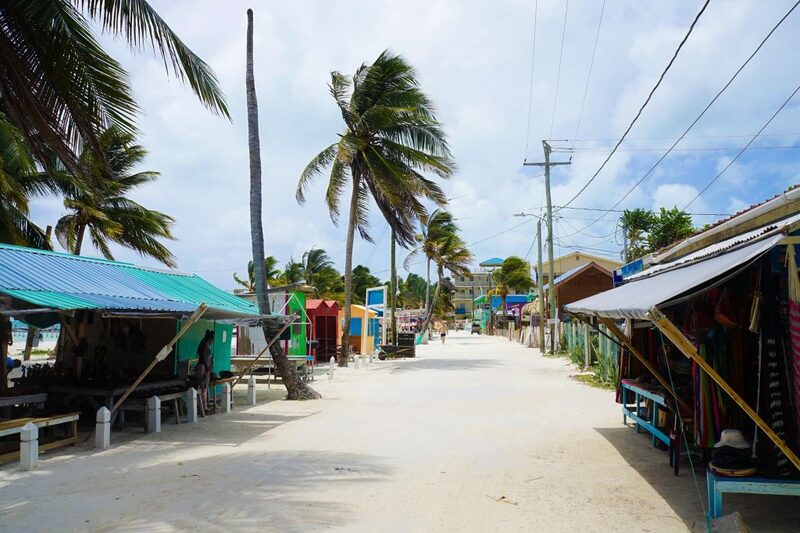 Not a place to come if you like a fast pace of life, but perfect if you’d like to truly unwind, Caye Caulker is a little slice of paradise set in the ocean. Hide your watch, order up a drink and enjoy!